Large scale ocean circulation and its role in climate and climate variability. Impacts of changing circulation on marine ecosystem and chemistry. Tropical oceanography and air-sea interaction. High latitude processes that link to Thermohaline Circulation. Cravatte, S., T. Delcroix, D. Zhang, M. McPhaden, and J. Leloup, 2008: Observed Freshening of the Warming Western Tropical Pacific and extension of the Warm/Fresh Pool in recent decades. submitted to Clim. Dynamics. 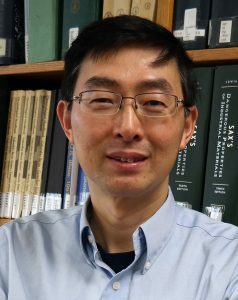 Zhang, D., and M.J. McPhaden, 2006: Decadal variability of the shallow Pacific meridional overturning circulation: relation to tropical sea surface temperatures in observations and climate change models. Ocean Modeling, 15, 250-273, doi:10.1016/j.ocemod.2005.12.005. McPhaden, M. J., and D. Zhang, 2004: Pacific Ocean circulation rebounds. Geophys. Res. Lett., 31, L1830, doi:10.1029/2004GL020727. Zhang, D., M.J. McPhaden, and W.E. Johns, 2003: Observational evidence for flow between the subtropical and tropical Atlantic: The subtropical cells. J. Phys. Oceanogr., 33, 1783-1797. Zhang, D., W.E. Johns, T.N. Lee, 2002: The seasonal cycle of meridional heat transport at 24Â°N in the North Pacific and in the global ocean. J. Geophys. Res., 107, 10.1029/2001JC001011. McPhaden, M.J., and D. Zhang, 2002: Slowdown of the meridional overturning circulation in the upper Pacific Ocean, Nature, 415, 603-608.